North East View of the New Theatre Royal, Covent Garden. The first foundation stone for the Rebuilding of this Theatre was laid by His Royal Highness the Prince of Wales, the 31st day of Oct.r 1808. the whole was executed in ten months, and opened the 18th of Sept.r 1809. Rob.t Smirke Jun.r Arch.t. Alex.r Copland, Builder. Drawn & Engraved by G.Hawkins, from Admeasurements. 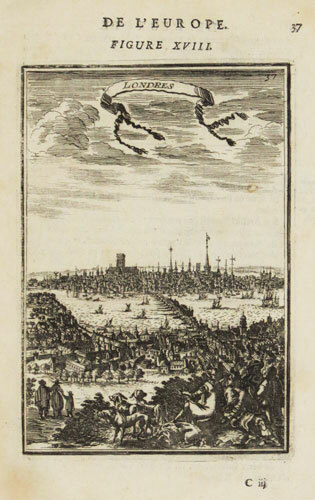 London, Published Dec.r 21st 1809 by Geo. Hawkins, No. 11 Queen Street, Golden Square. Fine coloured aquatint. 270 x 365mm (10½ x 14½"), paper watermarked Whatman 1808. 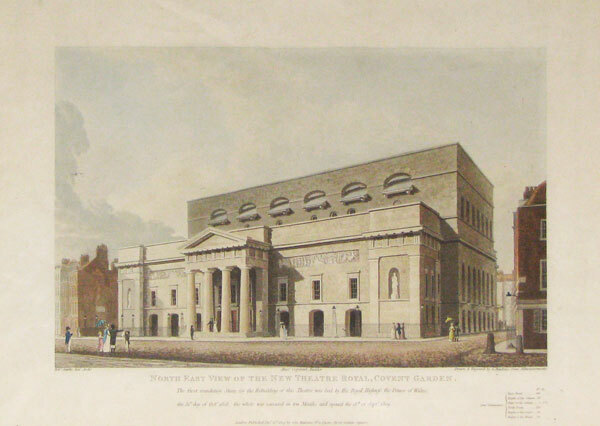 The second Theatre Royal, destroyed by fire 1856. A View of Lambeth Church upon the Thames. 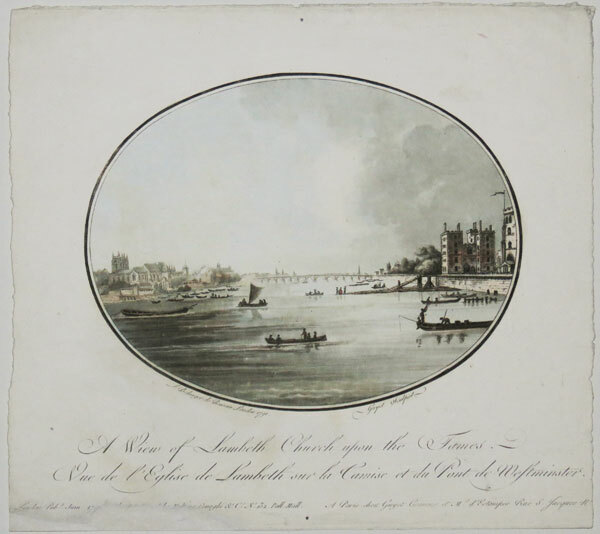 Vue de l'Eglise de Lambeth sur la Tamise et du Pont de Westminster. L. Belanger le Romain London 1791. Guyot Sculpsit. Rare mezzotint. Sheet: 230 x 255mm (9 x 10''). Trimmed within plate, repaired damage in bottom edge losing part of publication line. A view looking west along the Thames from London. Engraving. 150 x 105mm (6 x 4¼"), set in letterpress, very large margins. A prospect of London based on Claes Janszoon Visscher's view of 1616, from Mallet's classic five-volume work 'Description de l'Univers'. A View of Lord Barrymore's House in Picadilly taken from S. James's park. Vue de la Maison du Lord Barrymore dans Picadilly, prise du Parc de S. James. S. Belanger le Romain London. Guyot Sculpsit. London Pub.d Juillet 1792, as the act Direct by Molteno Colnaghi & Co No 132 Pall Mall. A Paris chez Guyot, Graveur et M.d d'Estampes, Rue S, Jacquesm No 10. Rare aquatint and etching with fine hand colour. 225 x 305mm (8¾ x 12"). Trimmed to plate. The house of the profligate Richard Barry (1769-93, 7th Earl of Barrymore, a rake and gambler known as 'Hellgate'), close to Apsley House at Hyde Park Corner. Barry died the year after this print was published and the house burned down soon after. After painter Louis Bélanger (1756-1816), engraved by Laurent Guyot (1756-1806). Etching. 155 x 255mm (6 x 10"), with very large margins. St Bartholomew's Hospital in Smithfield in the City of London. 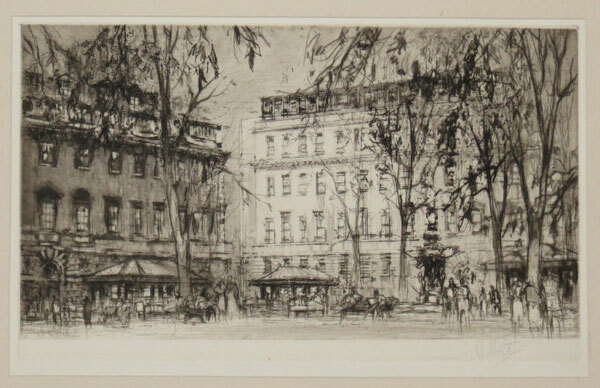 William Walcott R.E (1874 - 1943) was described by Furst as 'next to Brangwyn the greatest decorative etcher this country has produced'. This etching was commissioned by Sir Valentine Crittall, director of the Crittall Windows construction company, for Christmas 1938. Carlton House. 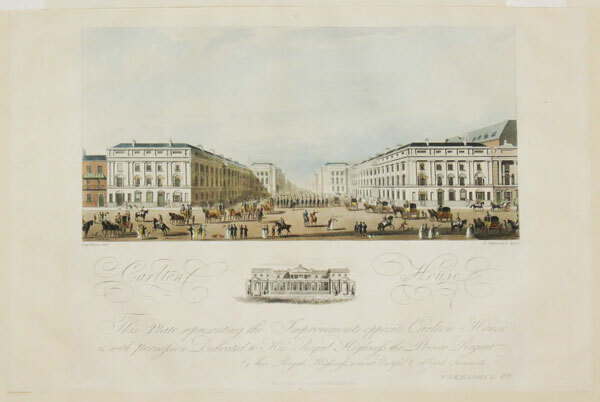 This Plate representing the Improvements opposite Carlton House is with Permission Dedicated to His Royal Highness the Prince Regent by his Royal Highness's most dutiful & obliged Servants. Colnaghi & Co.
Augt. Pugin delt. T. Sutherland Aquat. London. Pubd. May 1.1817 by Colnaghi & Co. 25 Cockspur Street. Fine coloured aquatint; 305 x 406mm (12 x 16"), on J. Whatman paper. Trimmed to plate, mounted in album sheet. The view north from Carlton House, on Pall Mall, an early 18th century house reconstructed at enormous cost by the Prince of Wales (later George IV) over a thiry year period. The house was the scene of extraordinary receptions and balls. 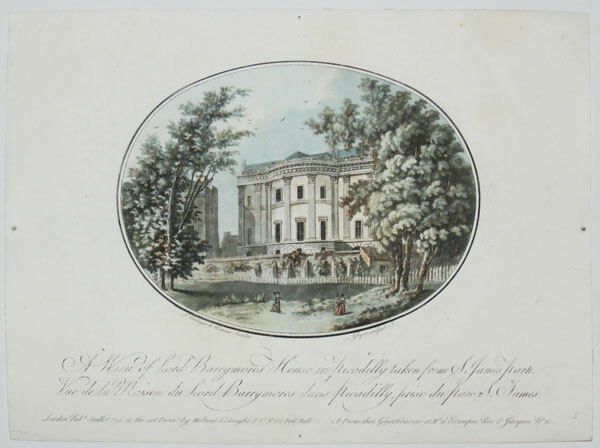 This print was made during the Regency, before the Regent ascended to the throne and decided that the house was not fine enough for his new elevated standing. The house was demolished and replaced by a terrace of houses (Carlton House Terrace).